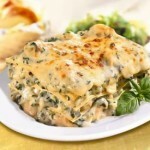 Chicken Lasagna Florentine is a crock pot recipe with spinach in a white sauce. Combine first 10 ingredients in large bowl and stir well. Coat crock pot with spray and place 3 uncooked lasagna noodles in bottom of cooker. Break noodles in half as necessary to fit. 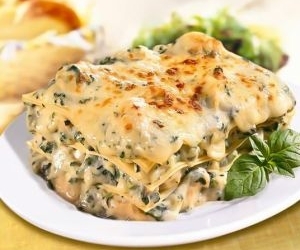 Spread ⅓ spinach mixture over noodles; sprinkle with ⅓ cup mozzarella. Layer 3 more noodles, half of the remaining spinach mixture, and ⅓ cup mozzarella. Top with remaining noodles and spinach. Sprinkle with remaining cheese. Cover with lid; cook on high 1 hour and reduce to low 5 hours or until done.